The owners of this property wanted a space with a dual purpose for both entertaining and relaxing. 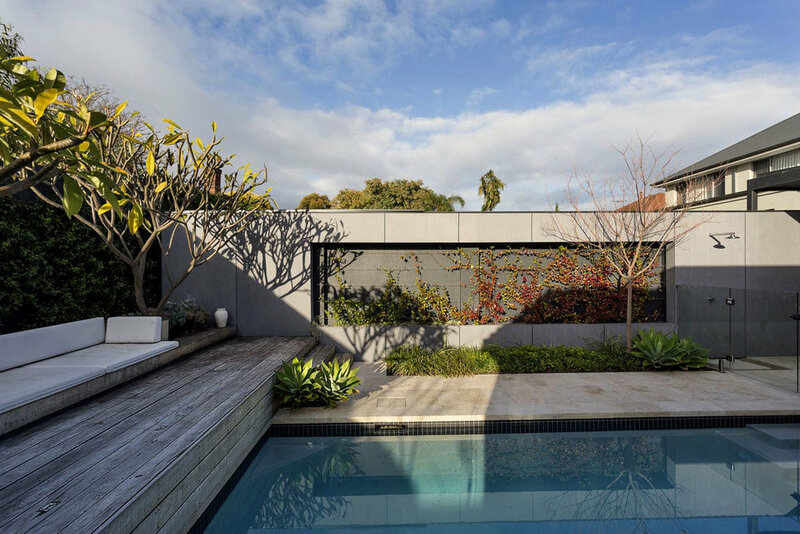 Designing a garden that created an outdoor retreat was the key to the success of this space, using a grey cladding with a boxed planter helped to soften the existing boundary wall, creating a coolness within the area. A large existing pool occupied the main area of the backyard, discouraging the owners from using their outdoor space. We shortened the pool and added a raised decked area at one end to create a different destination. With a weathered timber and a built-in raised daybed, it is a perfect area for our client to relax and casually dine within the pool area. At the opposite end, a louvered roof structure formed the ultimate alfresco area, while creating an elegant transition between the indoors and outdoors. What inspired the design? Where do you look for inspiration? The client wanted to create a space for entertaining and relaxing that was a seamless transition from the interior. Creating separate destinations that were all able to complement each other became paramount to a successful design. The scale and texture that is used, inspires a feeling of being in different places while only moving within the backyard. Can you tell us a bit about the design process? Every garden starts with a conversation… Our initial meeting with our client is an opportunity to explore the possibilities and expectations for their new garden. From this meeting, we can establish an integral part of the project, the design brief. The design brief is referenced by all key team members involved throughout the project to ensure that the client’s initial vision is realised in the completed garden. A series of images, sketch plans and 3D representations will be presented in order to communicate our combined ideas for the garden design. What were some of the key materials? The raised deck was made out of Fiji mahogany timber as its weathered grey appearance added raw texture to the area. This then follows through to Equitone cladding in the colour Tectiva which holds a boxed planter, adding depth and coolness to the destination. The Sand bond travertine paving gave a natural and simplistic manner to the flooring, allowing the focus features of the garden to emerge. How important is material and colour selection to the project? Finding the right material and colour in the project was key for its success. There were many elements to consider in this space and if they did not complement one another the space would feel small, cluttered and separate. When the doors are opened, the garden becomes a lavish extension of the interior, which is an incredible aspect to have especially in Western Australia, as our weather is amazing for most of the year. The addition of the louvered shutter system in the alfresco allows it to open for sun and close for rain meaning it can be used all year round. This Landscape is truly one that invites you to be amerced within its aspects.